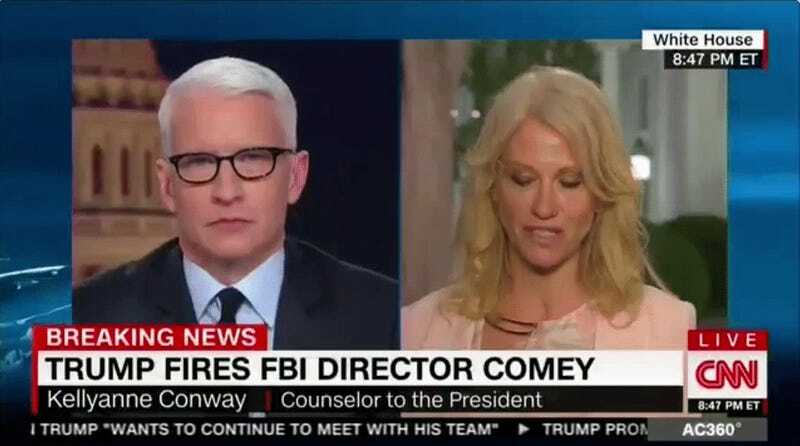 I’m not sure where they’ve been keeping Kellyanne Conway these days, but the unexpected firing of FBI director James Comey was event enough for the White House to rouse her from whatever hidey-hole they’ve been keeping her in and put her up against Anderson Cooper to defend the President. On his show Tuesday night, Cooper let loose with a wide range of clips of President Emperor Trump as Candidate Trump on the campaign trail, praising Comey for his investigation into Hillary Clinton’s emails. I should warn you that watching this is traumatic only because it will make you relive the election; however, what appears to be happening now is somehow worse, so maybe that makes it better. Your call. “So now, your White House is saying what he did was wrong, but previously as a candidate, Donald Trump was saying it was the right thing,” Cooper said, simply parsing out the past in light of the present. “You’re conflating two things that don’t belong together,” Conway says. “Thanks for the trip down memory lane.” Viewers were also treated to a carefully-executed Anderson Cooper eye-roll, which was quite deserved. After a lot of crosstalk, during which Conway seemingly refuses to acknowledge that there is an ongoing investigation into possible Russian interference in the 2016 election, she says “You know who is not the subject of the investigation, Donald Trump.” That’s right. He’s not. An awful lot of people around him are, including his former national security advisor Michael Flynn. But this isn’t about Russia. It’s about the integrity of the FBI or something. “If everybody would read his letter rather than try to squeeze it into a soundbite or wonder what he meant or try to besmirch him...” she says, without ever finishing her sentence to explain what would happen if we did in fact read the letter. Lucky for us, we can read the letter. It’s quite short. Here it is. There’s the letter! That second paragraph is quite rude, but seeing as there’s a whole mess of other things to worry about, I feel we will let it slide for now. “In the kind of a letter, why not ask for a special prosecutor or something?” Cooper asks. “But what does this have to do with the letter?” Conway says in response. Maybe you’re right, Kellyanne. It doesn’t have anything to do with the letter. It has to do with Russia. The letter is about Russia and the investigation. It is about Donald Trump, a man who reportedly dispatched his personal bodyguard to deliver the letter to Comey, trying to defuse what will eventually become a volatile situation that he cannot control.